Waaaaaay back when I was a young pup, in my early twenties, I first discovered the Armour-Stiner House, in Irvington, New York. 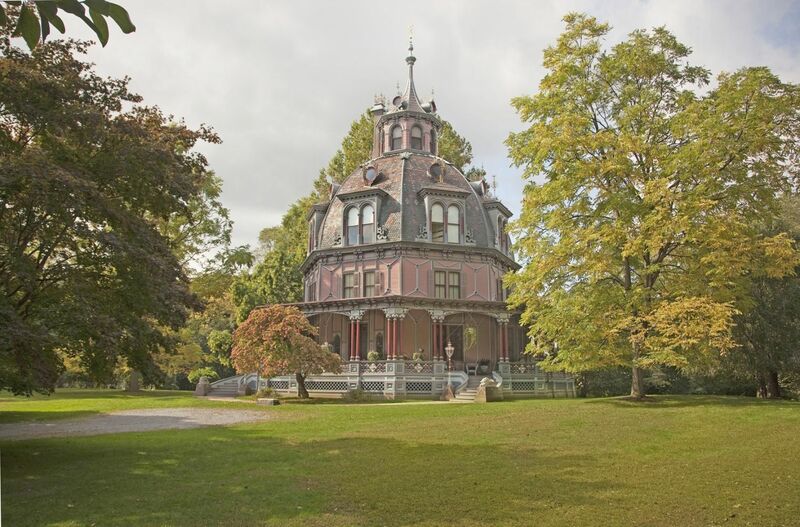 The house is a famous octagon-shaped structure, and was built in 1860. By the 1970s the house was a wreck, and the huge domed roof was literally crushing the house, and would have soon wholly collapsed. A savior came along in the guise of Joseph Pell Lombardi, who was a young architect specializing in restoration. As the years passed, I kept abreast of the house, and Pell’s progress. The work seemed, to me, overwhelmingly monumental, and I truly never expected the house to be finished. I was wrong. And I have never been happier being wrong. Pell has completed what I believe to be THE most extraordinary restoration undertaken by an individual. The results take my breath away. The glorious AFTER images cannot in any way convey the condition of the BEFORE which Pell so bravely, crazily undertook. Meticulous research uncovered the startling original colors. …and AFTER images of the vestibule. …and AFTER images of the solarium. …and AFTER images of the music room. Astonishing. …and AFTER images of the dance hall. This just makes me gasp. I offer just these tantalizing bits about the house. Enjoy. Looking at the miracle Lombardi realized gives me hope for humanity. What an AMAZING house! The photos even make it look dreamy, like paintings. Wow. That dance hall alone is amazing! I’d love to get a chance to shake a leg & cut the rug there, so to speak. Yes, it, like other things I try to find in my life, be it art or music or acts of kindness or spring’s delightful display, does give one hope for humanity. Something I find especially important in today’s world with that moron in a Potus cap playing with our lives & futures.